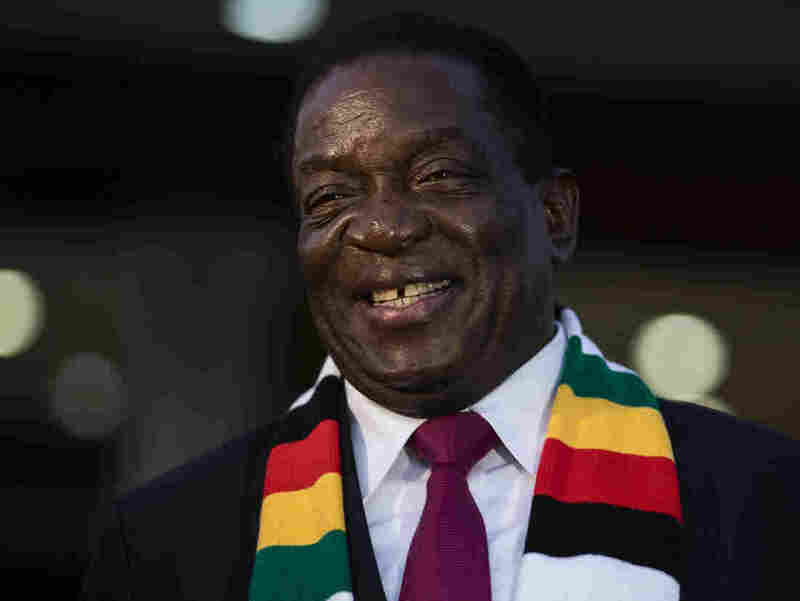 Zimbabwe Court Affirms Mnangagwa's Election Victory The main opposition party alleged that authorities had falsified the results, which gave President Emmerson Mnangagwa a slim majority. But the court said those claims weren't sufficiently backed up. President Emmerson Mnangagwa smiles for photographers after a news conference earlier this month in Zimbabwe's capital, Harare. The decision deals a blow to the Movement for Democratic Change and its candidate, Nelson Chamisa, who has repeatedly alleged that the election was sabotaged by an official electoral commission in league with Mnangagwa. Even before polls had closed, Chamisa was tweeting that there had been "a deliberate attempt to suppress and frustrate" some of his likely voters. Those claims only gathered greater urgency as voters waited days for the commission to announce who won. In those anxious days, six people were killed in clashes between security forces and protesters, and police raided the opposition party's offices. The violence called to mind a darker era of "old Zimbabwe," when the country was ruled by strongman Robert Mugabe. The iron-fisted president had been the only leader Zimbabwe had known in nearly four decades of independence — that is, until he stepped down late last year under pressure from the military and Mnangagwa, an erstwhile ally who had served as Mugabe's spymaster before the two had a falling out. After Mugabe's ouster, his ruling party, the Zimbabwe African National Union-Patriotic Front, retained power and Mnangagwa slid into Mugabe's seat. Despite initial signs of reform, including invitations to international election observers, the latest allegations of election irregularities sound similar to the alleged fraud perpetrated under Mugabe's regime. NPR's Eyder Peralta explained the pillars of the opposition's argument laid out in the legal challenge, filed a week after results were announced: "The presidential vote and parliamentary votes were off by tens of thousands; more than a dozen polling stations presented identical results and the electoral commission changed the results three times." But those assertions were too "general" and unsupported by specific "sufficient and credible evidence," Chief Justice Luke Malaba said Friday, noting Chamisa and his attorneys should have opened up the ballot boxes to compare those votes to the official results. "The best evidence would have been the contents of the ballot boxes themselves." "We were not surprised by the court's decision," Mnangagwa tweeted Friday. "The election results were firmly in line with all the pre-election polling, and were entirely consistent with the final tally of [the Zimbabwe Election Support Network], the largest body of independent observers." After criticizing the MDC for "the wholly unnecessary violent protests," he immediately struck a different tone with his 40-year-old opponent. "Nelson Chamisa, my door is open and my arms are outstretched, we are one nation, and we must put our nation first," he said. "Let us all now put our differences behind us. It is time to move forward together." That hopeful note clashed with what NPR's Eyder Peralta saw Friday in Harare, an opposition stronghold. "Lots of hope for change gone," he observed, " just as spring takes a hold on the city." As for the Movement for Democratic Change, its secretary-general, Douglas Mwonzora, said the party would abide by the decision. "There are other means to resolve this dispute, but the MDC wants to make it clear that it will act within the confines of the law," he said, according to The Guardian. In the meantime, Mnangagwa's inauguration is back on. After a delay for the court to consider the opposition challenge, the ceremony is expected to be held this weekend.